Are you trying to lose weight? Here are 5 foods to watch out for. You will only gain weight if you eat these in excess. In order to eat this and still lose weight you need to make sure you don't eat more than your daily energy requirements. You can use many calorie apps such as the body weight planner developed by National Institute of Health to help you lose weight. This constitute fruit juices, soda, soft drinks and sweet drinks. Sugary foods are not exempt from this. they include cookies, cakes, ice cream etc. These sugary drinks/foods are very high in calories and they are very easy to eat. Always remember that excess calories are converted to fats and stored in the body. These include chin chin, potato chips, biscuits and all you can think of. they are high in sodium and calories. 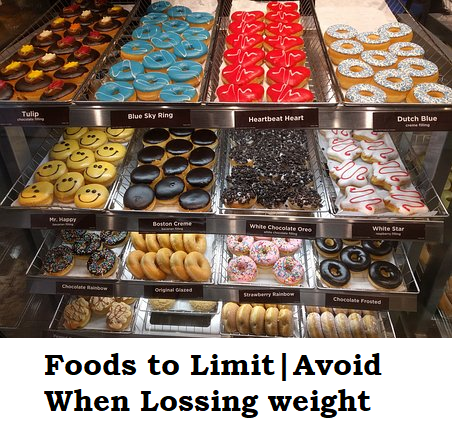 What makes it unhealthy for weight loss is that you can eat large quantities and yet not be satisfied, leading to unexplained weight gain despite your efforts. Drinking wine in moderation has health benefits whether it is palm wine or any other. Here in lies the problem, drinking wine it excess. It can lead to weight gain. Same goes for beer. In other to lose weight, drink these in moderation. These dressings are not healthy as you are made to belief. Every one who wants to lose weight has thought of eating salads at some point in time. They are very very healthy for weight loss, unless you make healthy salad dressings. The commercial ones are high in fats and preservatives, besides you don't know what other chemicals have been added to mimic the taste of natural salad dressings. White bread is a staple in many homes across the globe. It is not healthy because it has been highly refined and contains almost no nutrients, but for calories, which are very high. Bread made from whole wheat is healthier. Losing weight still boils down to one simple trick, you need to make sure what you eat is less than what you spend. There are people who eat all of these foods and still lose weight, because they make sure they don't eat out of their calorie range. Others have used weight loss supplements to help them burn calories while eating these foods. WeightWorld is an online store stocked with the best weight loss products and supplements at affordable prices.